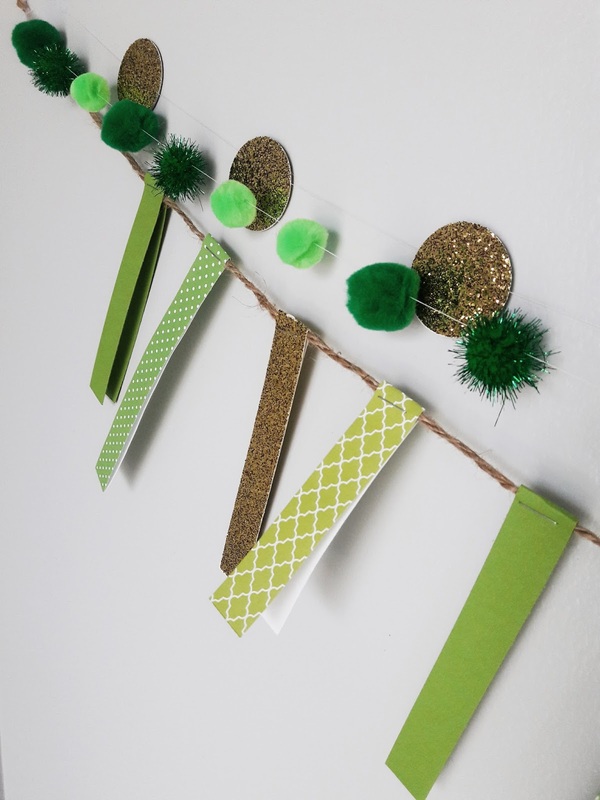 A few years ago I shared a tutorial for a St. Patrick's Day pom pom garland. 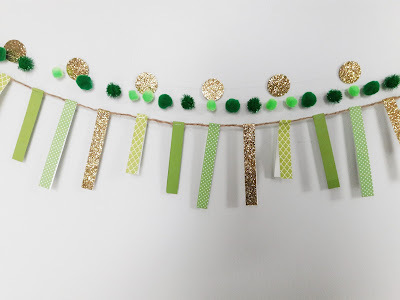 I had a few other garlands I wanted to make and decided they would be perfect for layering with the green pom pom garland I made previously. I have wanted to make one of these to have on hand for events for quite some time. I thought that the gold would be perfect for St. Patrick's Day as well. Cut out the circles with the paper punch. Cut string into desired length. Place the gold circles along the string at the distance you prefer. Using the glue gun place a line of glue on the back of one of the paper circles and apply the string to the wet glue. I did a circle on both sides of the string so that if the garland turned while hung it would show a gold circle either way. I have seen garlands that use only one circle. You can use one circle if you'd prefer. If you would like to use two, place another paper circle on top of the wet glue lining up the circle outline to the other paper circle's outline on the opposite side of the string. I got the idea for the paper strip garland here. Cut the paper into strips 3/4 an inch wide. Cut the strips 12, 11, 10 and 8 inches in length. Cut the twine to your desired length. Lay out the cut strips in the order your prefer. Fold each strip in half over the twine. Staple into place at the top. All of these garlands were so easy to make and I love how they looked layered together. 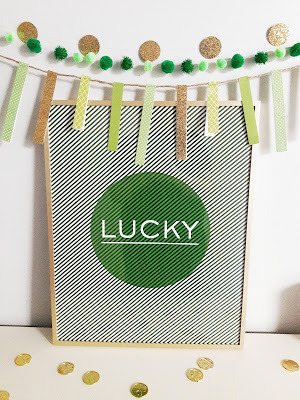 We do not have many decorations for St. Patrick's Day so I loved adding some more festive pieces to our house. How do you decorate for St. Patrick's Day?